(1) Also other techniques exist which allow to draw transparent faces order independent - e.g. Weighted Blended Order-Independent Transparency. At first all Framebuffers are rendered in the order in which they are defined in the scene graph. At last the back buffer is rendered. 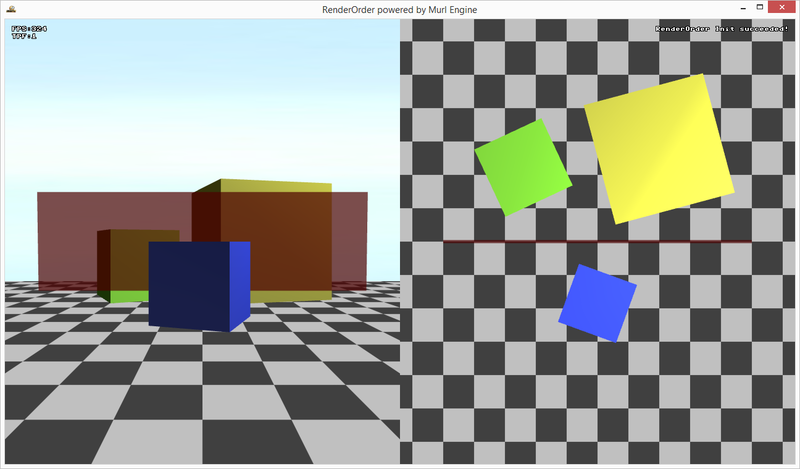 For each frame buffer / back buffer one or more Graph::View objects can exist. A view specifies a display window or a region in the window (integer coordinates, pixels). The view has always the same size as the corresponding frame buffer / back buffer. A view mask can be used to restrict the drawing area to a smaller, rectangular region ("scissor test"). The render order can be defined with the attribute depthOrder. If the depthOrder value is the same for two views, the order in the scene graph defines the actual render order. A higher depthOrder value results in the view being rendered later, i.e. on top of all other views in the same frame buffer with lower depthOrder values. A Graph::Camera object specifies a visible area within the virtual world (floating point coordinates). The render order can be defined with the attribute depthOrder. If the depthOrder value is the same for two cameras, the order in the scene graph defines the actual render order. A higher depthOrder value results in the camera being rendered later, i.e. on top of all other cameras within the same view with lower depthOrder values. Each camera renders its objects (assigned by child nodes or with the Graph::CameraState node). The rendering can be split up into several layers. By default, all geometries are rendered to layer 0. A Graph::LayerState node with the attribute index can be used to switch to a different layer. Attention! In order to save resources, layers should always be used consecutively, starting with 0 (e.g. 0, 1, 2, 3 and not 0, 12, 20, 30). The render order is defined by the layer index, higher values are rendered later. The rendering of each layer is done in two passes, depending on the Graph::Material and the objectSortMode attribute. In the first pass (pass 0) all objects are rendered, where the objectSortMode of the Graph::Material is equal to OBJECT_SORT_MODE_BY_MATERIAL. In the second pass (pass 1) all objects are rendered, where the objectSortMode of the Graph::Material is equal to OBJECT_SORT_MODE_BY_DEPTH. Materials that write the depth buffer (DEPTH_BUFFER_MODE_WRITE_ONLY or DEPTH_BUFFER_MODE_READ_AND_WRITE) use OBJECT_SORT_MODE_BY_MATERIAL (Pass 0). All other materials use OBJECT_SORT_MODE_BY_DEPTH (Pass 1). In pass 0 the attribute sortOrder of the material defines the render order. sorOrder attribute of the material. Distance (if the sortOrder is equal, sort from back to front). depthOrder attribute of the geometry (if the sortOrder and distance is equal, sort by the depthOrder attribute). The method to determine the distance can be specified with the depthSortMode attribute of the Graph::Camera (e.g. no depth sorting, z-value, distance – see IEnums::DepthSortMode). The depthOrder attribute of the parent node is passed to the child node. The resulting depthOrder of the child node is the sum of the depthOrder of the parent node and the specified depthOrder of the child node. If a child node should be rendered behind a parent node, a negative depthOrder value can be used for the child node. Group objects with same lighting. The grouping is done automatically and is not deterministic. As a simple example we show how to use multiple views and cameras and draw several objects with different materials. We use a background_camera to clear the display and the depth buffer and a main_camera to draw the background. The background_camera must be activated using a CameraState node because it does not contain any child node. Otherwise the camera would be skipped by the renderer. The main_camera is used to draw a texture. Additionally we define a view_left and a perspective camera camera_left. The Graph::View is restricted to the left half of the screen with the attribute rightMaskCoord. The center of the Graph::Camera is also moved to the center of the left half. For the right half of the screen we define a view_right and an orthographic camera camera_right. We again restrict the Graph::View and move the center of the Graph::Camera. The two cameras render the same scene in different views. main_camera uses a blue image to draw the background. camera_left renders the scene with a perspective camera. camera_right renders the scene with an orthographic camera in a bird's eye view. To get a correct render result for the opaque and transparent faces we use depthBufferMode="READ_AND_WRITE" for the opaque material and depthBufferMode="READ_ONLY" for the transparent material.